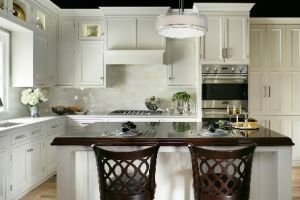 Brooks Custom is known for its lasting wood countertops and furniture which stand above the competition in two key ways. 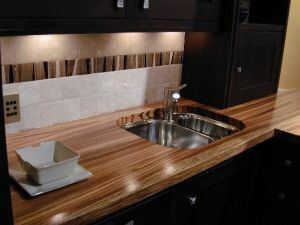 One key difference is the quality provided not only by the premium materials but in the skilled craftsmen that build every wood countertop by hand.The other, and perhaps more important advantage is Brooks Custom’s signature Marine Finish. 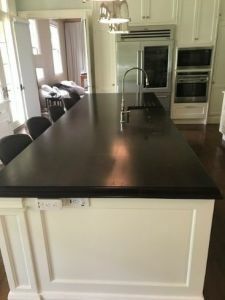 This hand-rubbed finish has been formulated over the years to be the most durable and long-lasting finish in the wood countertop industry. The Marine Finish comes standard on all premium wide plank countertops. The finish is hand applied by our experienced craftsmen with years of knowledge in how to get the best looking finish with the most durability. The resulting Marine Finish is permanent and low-maintenance, which is very important to our residential and commercial customers. For the first month after installation, we suggest being gentle on the finish, as it is still curing to its maximum durability. After that, there is no special care required for the Marine Finish. Regular maintenance and cleaning can be done with Windex or Lemon Pledge. We also provide a bottle of Weiman’s Furniture cream with every order. This polish is meant to be applied seasonally (4 times a year) or whenever the top needs to be returned to its original luster. When installed or delivered, the fresh Marine Finish will have a slight sheen that will eventually fade a more furniture-like satin finish. The satin sheen makes it easier to maintain and aids in creating a timeless design that will hold up for years. 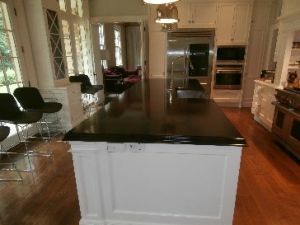 Though the Marine Finish has great durability like most countertop finishes it’s not indestructible. The finish is waterproof, stainproof, and resistant to heat. What may cause damage is sliding abrasive ceramic pots across the surface or damage from cutting directly on the surface. Another huge advantage to the Marine Finish is that it’s the only wood finish that can be repaired on-site. For small problems, like water rings or areas where the finish has worn over time, we can send one of our skilled technicians to repair the affected areas on-site. Over time, you may find that your finish has dulled to the point where you would like it refinished. For this, we can bring the countertop back to our shop in Mt. Kisco, and make your wood countertop look new again. 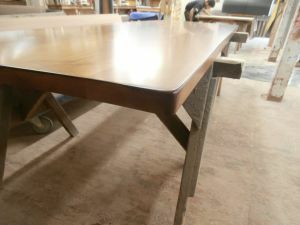 This isn’t something that happens often and is requested mostly by those who love their wood top and want to have it freshened up. When done, the finish is fresh and the tops look new again! To get a hands-on look at the Marine Finish, you are welcome to visit Brooks Custom’s showroom in Mt. Kisco, NY. We are open Monday-Friday from 8:30am-4:30 pm; no appointments are necessary during the week. Some Saturday morning appointments may be available. New & Improved Brooks Custom Sale Page!